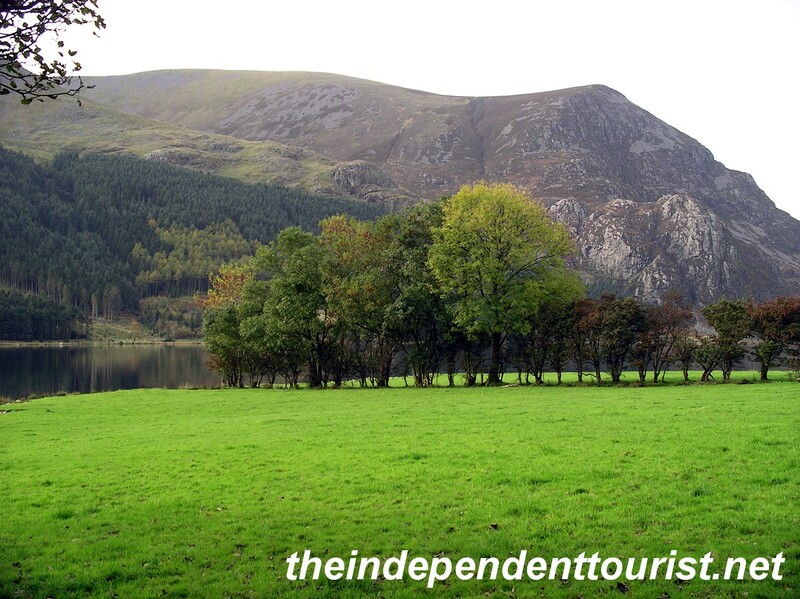 The country of Wales has much to offer and attracts fewer tourists than other parts of Great Britain. The sights below are not far from Cardiff, the largest city and capital of Wales. For a map of places visited in Wales click here. Caerphilly Castle. 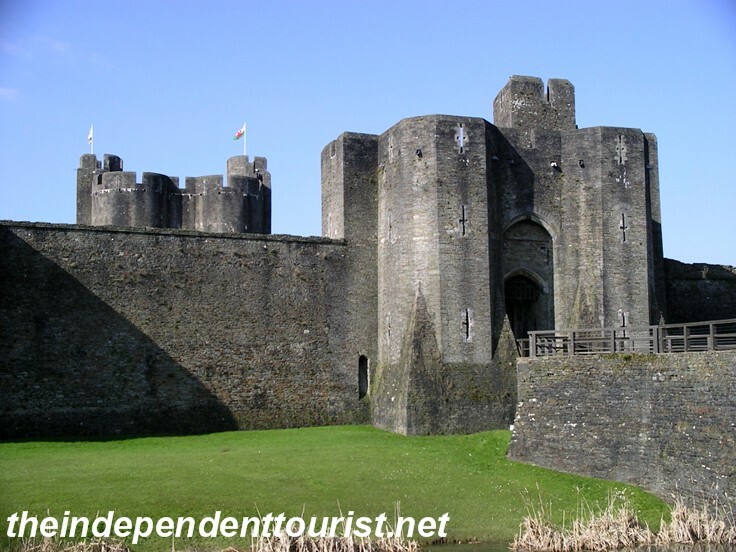 Caerphilly Castle is just north of Cardiff (about 6 miles). 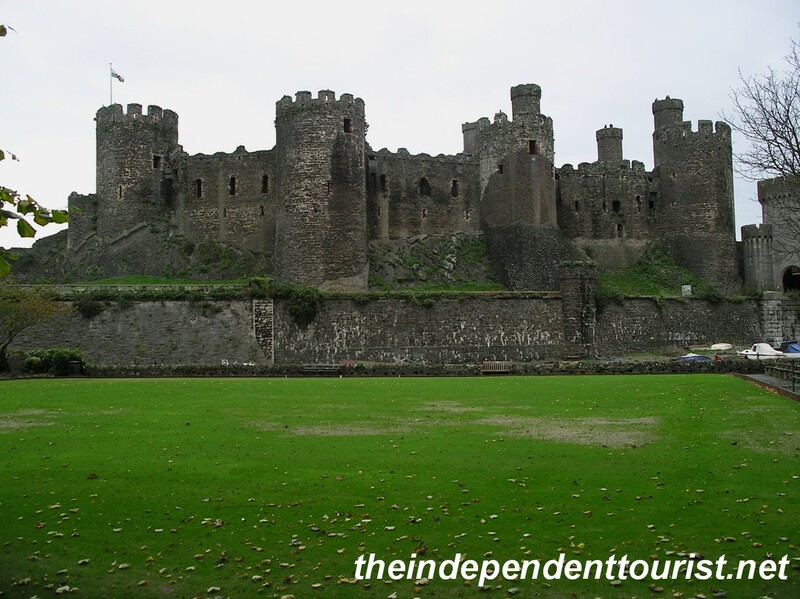 It is the largest castle in Wales and the 2nd largest castle (in area) in Britain. Construction on Caerphilly began in 1268 and its design changed the direction of castle architecture in Britain due to its use of several revolutionary defensive features, including its massive rings of concentric walls and a sophisticated system of moats and lakes. 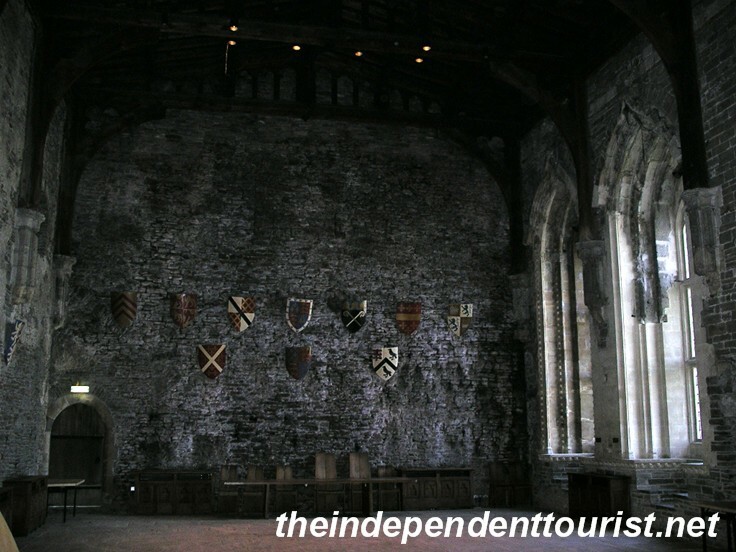 Interior of the Great Hall, Caerphilly Castle. The immense lake surrounding Caerphilly Castle. Near the entrance are some great examples of siege engines—they are huge, and must have caused a lot of damage by hurling huge projectiles hundreds of yards. 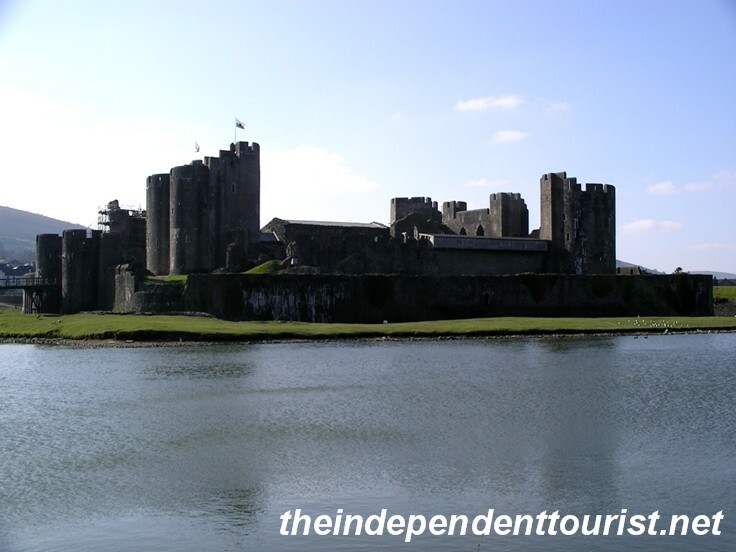 The main features of Caerphilly are the walls, towers, Great Hall and water-filled moats. Well worth a stop! 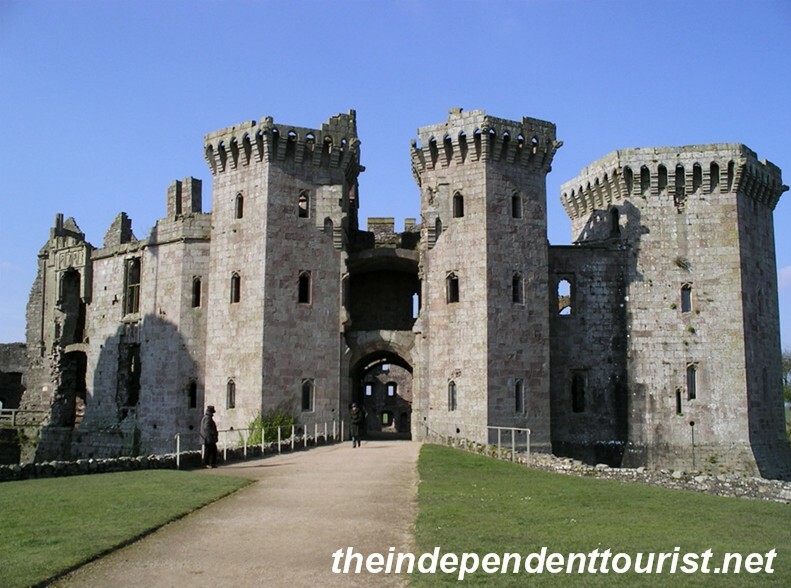 Raglan Castle. 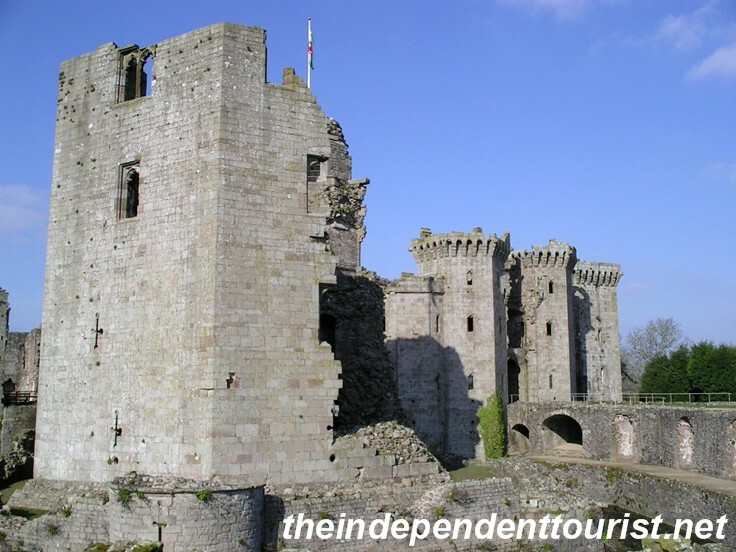 Raglan Castle, located northwest of Cardiff about 32 miles, is interesting in a number of ways. It was one of the last “medieval” castles built in the UK, with initial construction having begun in 1432 on the Great Tower (which is really after the medieval era). 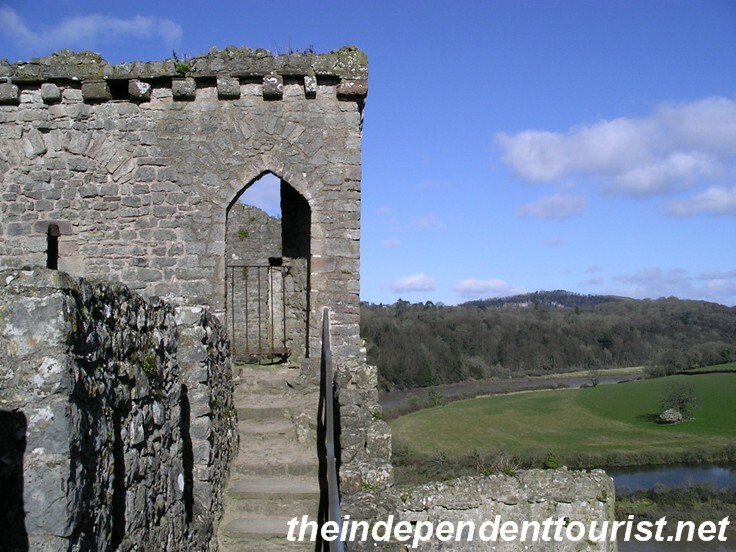 The gatehouse range – the entrance to the castle since the 1460’s. An imposing sight to visitors in the 1400’s and today. The remants of the Great Tower (center left), the first edifice constructed at Raglan. It withstood heavy attacks during the civil war in 1646. Also, the main castle was built separately from the stronghold, or keep (called the Great Tower), rather than the typical medieval arrangement of the castle walls and living quarters extending from and surrounding the keep. The Pitched Stone court at Raglan. It was the domain of the household staff–containing kitchens, pantries, and offices. The Fountain Court. The main residences, chapel and main Hall were located here. Additionally this castle was transformed in the early 17th century into an Elizabethan mansion with extensive terraced gardens, fountains and a man-made lake, rivaling many of the great palaces of its time. While the gardens and lake have not survived to the present day, their traces can still be seen. I really enjoyed visiting this castle – it is large and has a number of interesting features and (ruined) rooms. Most of the castle we see today were constructed in the 1400’s and 1500’s. Tintern Abbey. Ok, it’s not a castle, but Tintern Abbey, about 36 miles from Cardiff and just 5 miles north of Chepstow along the River Wye is a classic medieval abbey ruin. An exterior view of Tintern Abbey from the monk’s working areas. 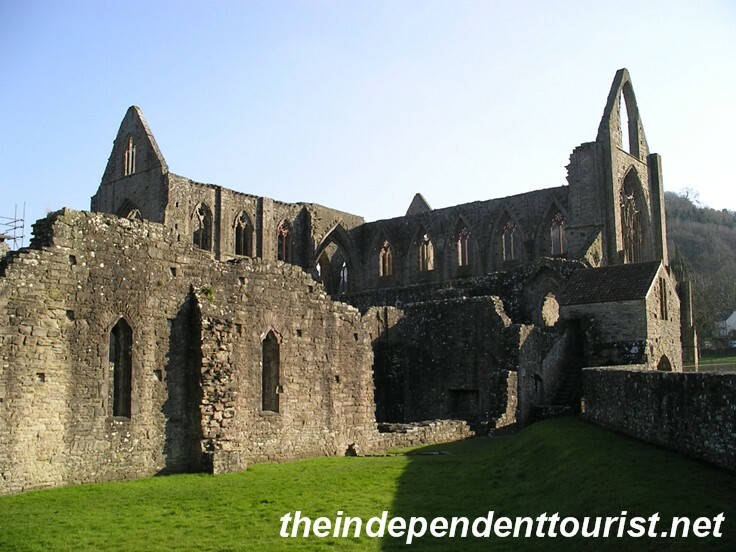 Another exterior view of Tintern Abbey. The soaring interior space of the great church with the green grass floor and the elegant architecture with towering columns and intricate windows frames is a beautiful sight. 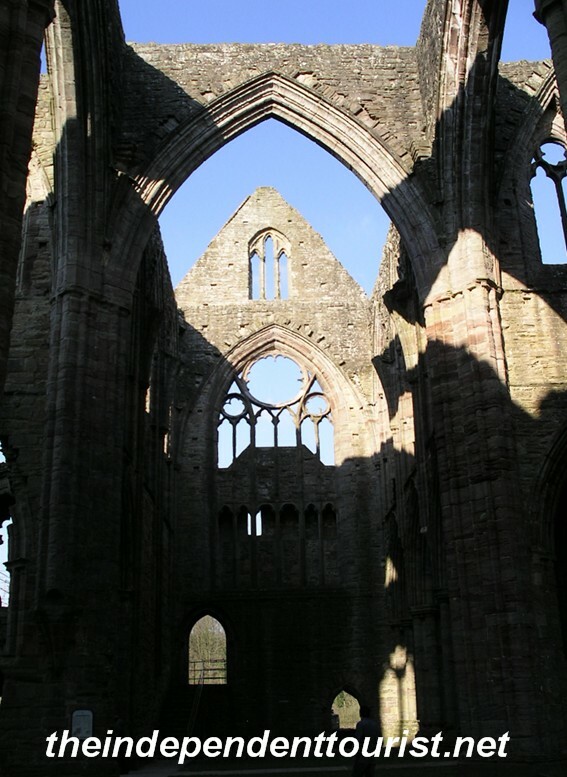 Another interior view of Tintern Abbey, note the fine window detail. I love medieval abbeys as much as I do medieval castles. 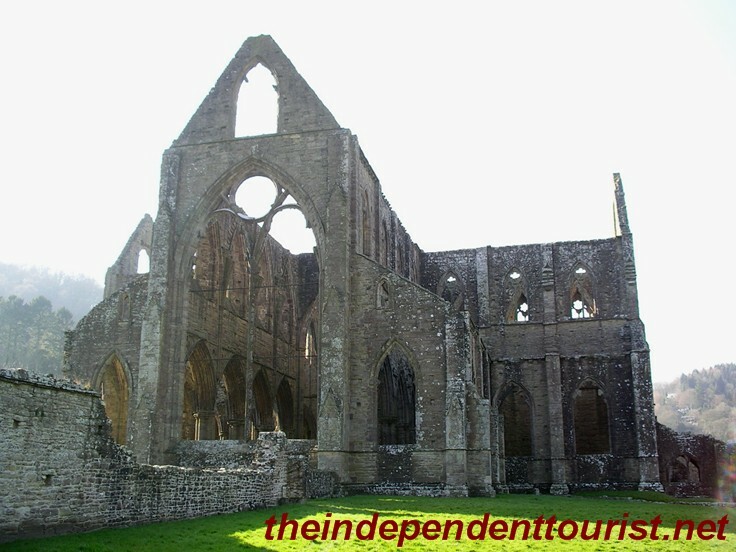 Tintern was a Cistercian abbey, originally founded in 1131, and the present church we see today was built between 1269 and 1301. 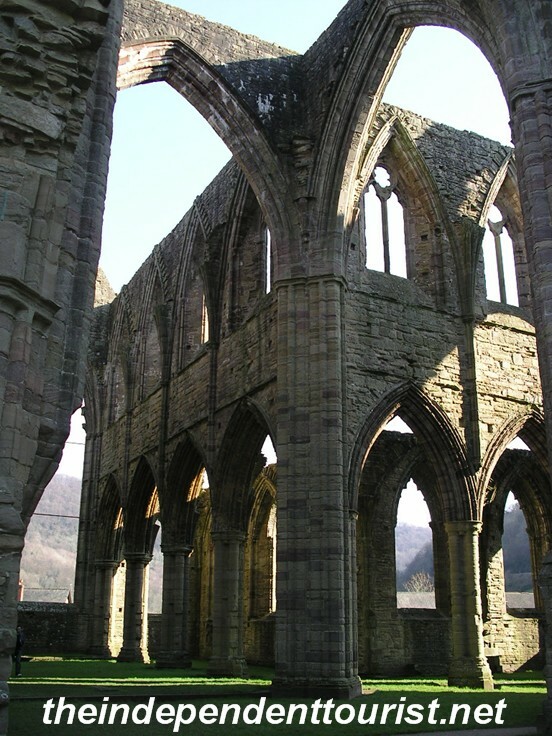 In its prime, up to 400 monks lived at Tintern and the abbey was an economic hub of the area for 400 years, overseeing vast agricultural production and other activity. There are a number of other ruins to see in the monastery (living quarters, infirmary, and chapter house) in addition to the church. There’s lots of good informational signage around the site. 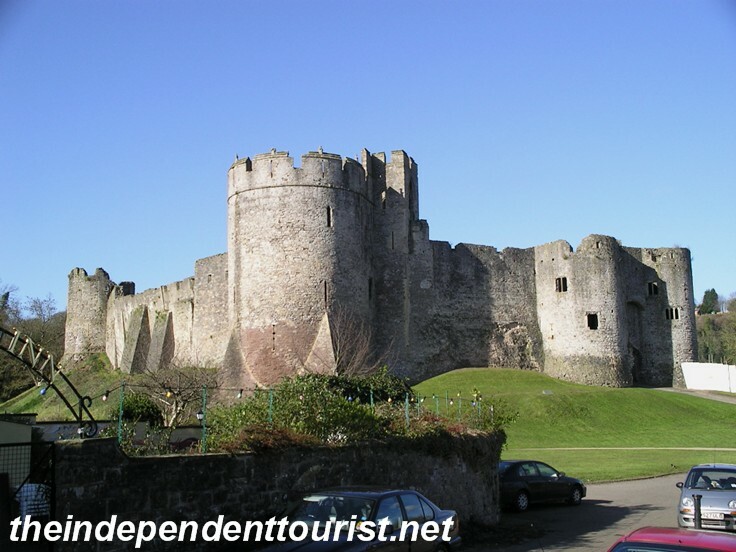 Like northern Wales, southern Wales has some outstanding castles and other interesting historical sights, all within a small geographic region. The Romans settled this area around 48 AD, and their influence can still be seen in a number of ruins. 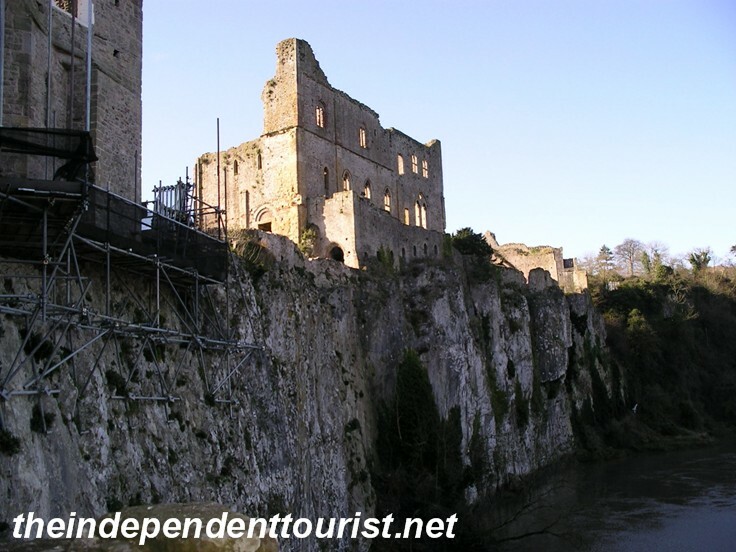 Chepstow Castle is one of the oldest surviving castles in Britain. Construction started on its great tower around 1081, just 15 years after William the Conqueror landed in southern England and changed the course of English history. A view of Chepstow Castle, with Marten’s Tower in the center and the well-fortified twin tower main gatehouse on the right. These are late 12th century castle additions. The Lower Bailey of the castle. Domestic accomodations such as kitchens, latrines, other chambers are located here. 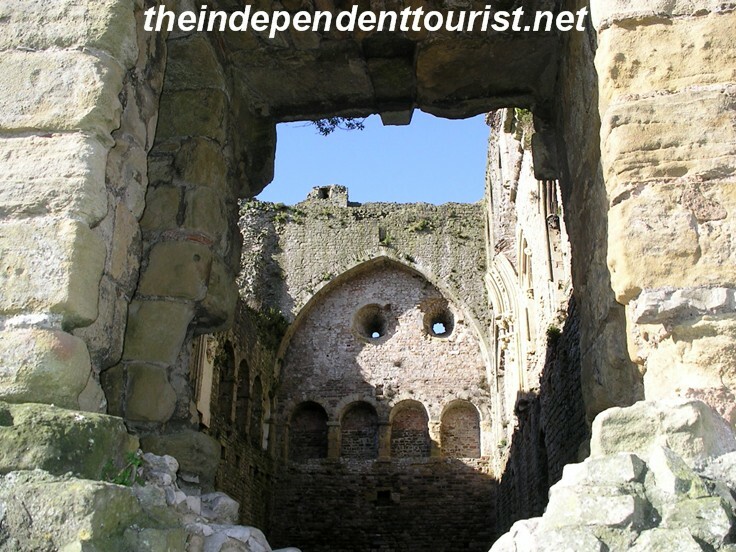 If you love medieval castles, Chepstow doesn’t disappoint. It sits on a sheer cliff over the River Wye, near the mouth of the Severn River, on the border of Wales and England. This image shows the Great Tower and how it and the castle walls sit right on the edge of the cliff over the River Wye. The castle was built to defend William’s newly conquered territory from the Welsh. A view inside the Great Tower, a three story building, quite tall in its day. The builders used Roman stone blocks in its construction. A view of the Welsh countryside and River Wye from the Upper Barbican of Chepstow Castle. 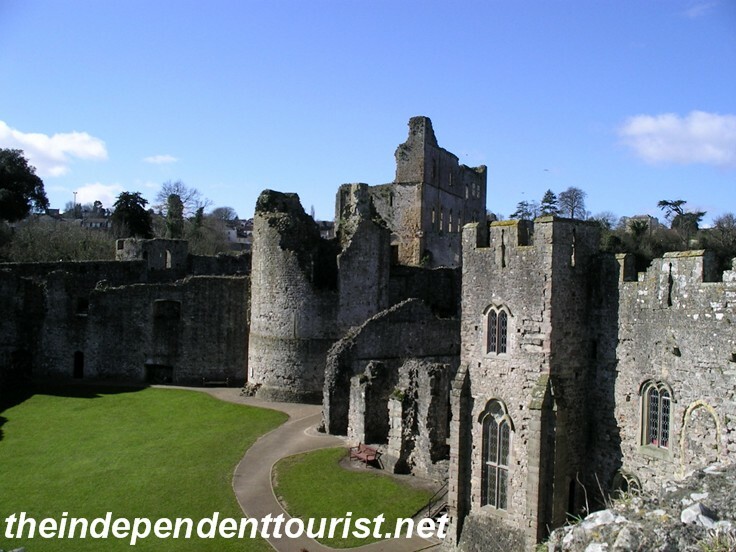 Chepstow is a large castle, with four distinct courtyards or sections. Supplies were brought to the castle via the River Wye using a hoist into storage rooms cut into the solid rock below the main castle. Another view of Chepstow Castle. I highly recommend a visit to this castle, one of my favorites in Britain. Caerleon Fortress. 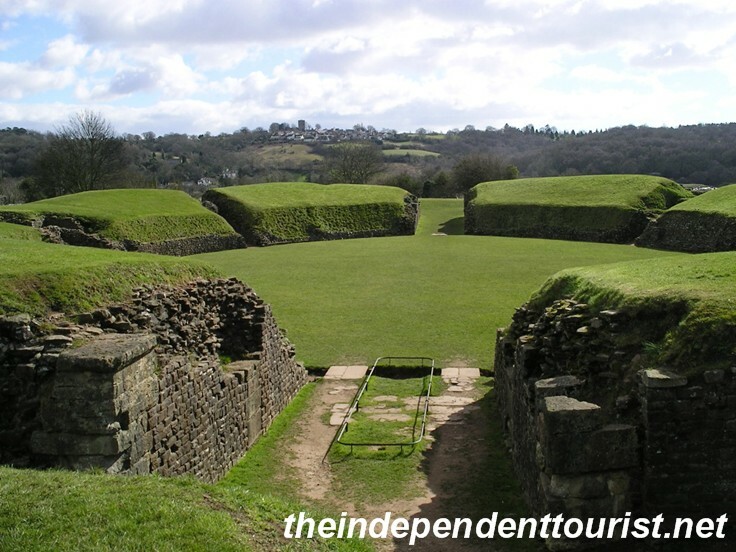 Just west of Chepstow near the town of Newport is Caerleon Fortress, a Roman army site founded in 75 AD, home to one of the three permanent legions in Britain. 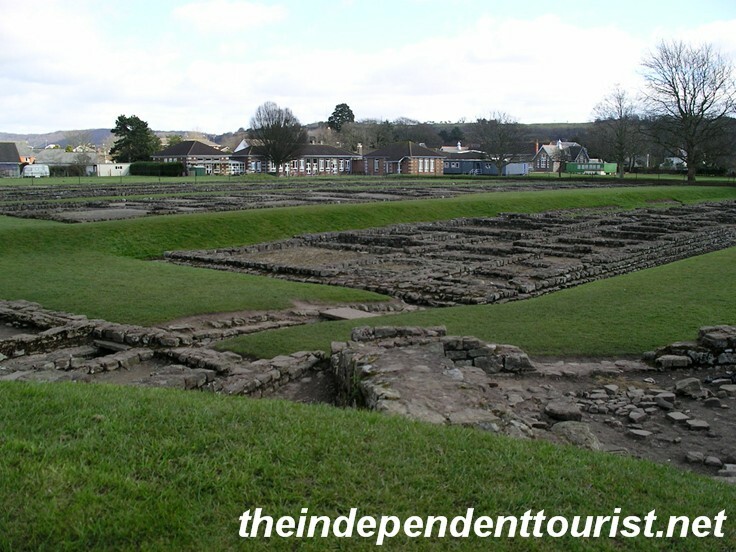 The foundations of the barracks and latrines at Caerleon. What remains are the foundations of the barracks and latrines (laid out with Roman efficiency), an amphitheater and ruins of the baths. The amphitheater is still used for various events. The site is definitely worth a visit, and provides a feel for life in the Roman army in Britain. Cardiff Castle. Cardiff is only 13 miles west of Newport and 32 miles west of Chepstow. 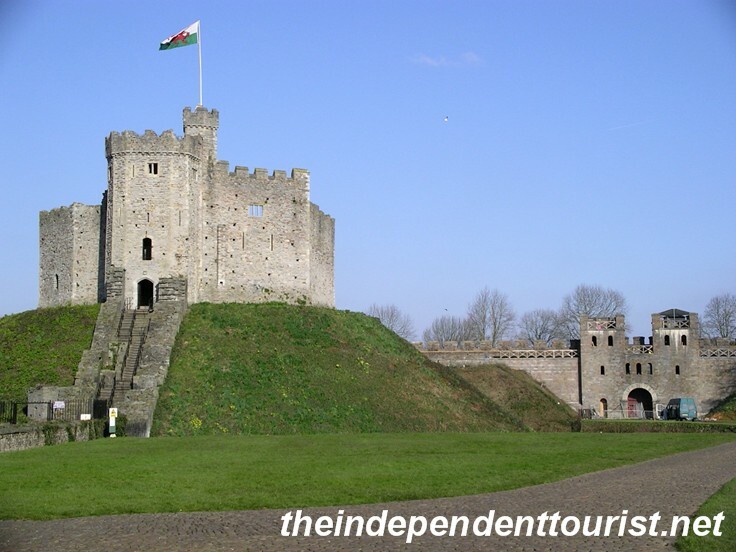 Located right in the heart of the city of Cardiff, the castle grounds are impressive and surrounded by a large wall. There isn’t much remaining of the medieval castle other than the walls of the octagonal keep which sits on a high mound (motte) in the middle of the castle grounds. There are some other beautiful neo-Gothic buildings that are part of Cardiff Castle. In addition, exhibits show part of an old Roman wall, and other items since this was the site of a Roman fort around 50 AD. Posted in Wales and tagged Caerleon Roman Fortress, Cardiff Castle, Castles in Wales, Chepstow Castle on November 1, 2013 by Paul Terry. Caernarfon Castle. Probably the finest castle in Wales and one of my favorite in the UK. 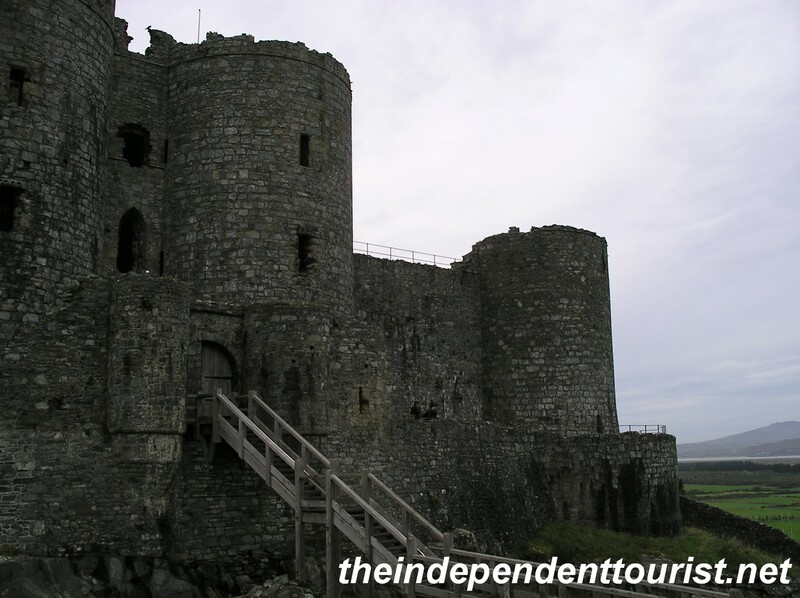 Unlike many castles, it does not occupy a high ridge or mountain top, but rather is set strategically at the mouth of the River Seiont and the Menai Straight on the western coast of Wales. A view of Caernarfon Castle from across the River Seiont. 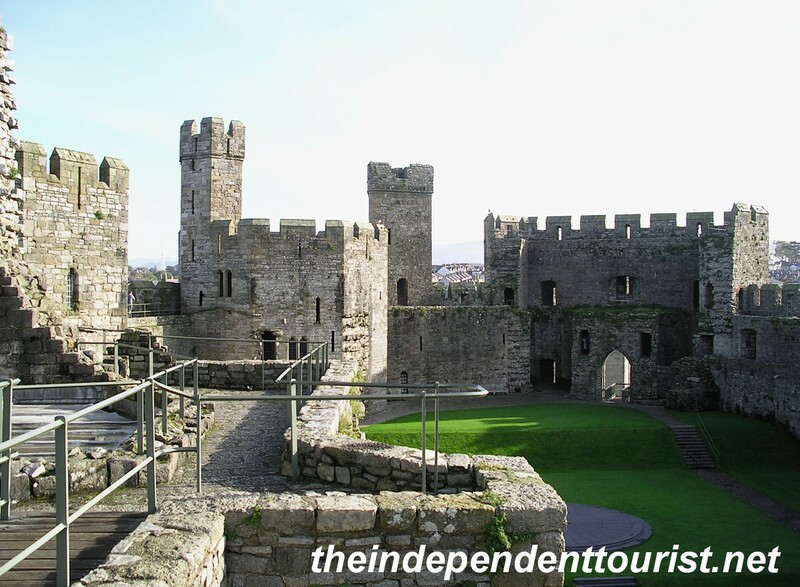 The town of Caernarfon, like Conwy, is enclosed by walls with the castle in a corner of the fortifications. 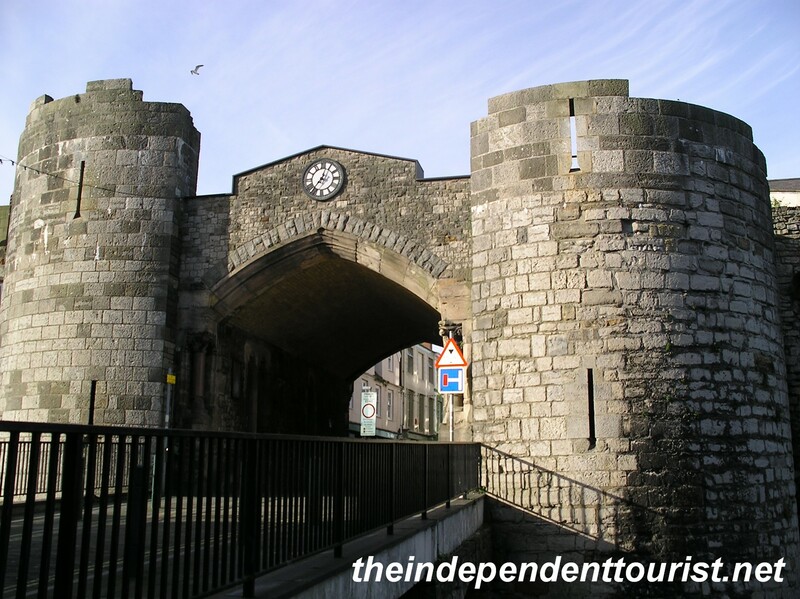 The Exchequer Gate, the main entrance into the the medieval village of Caernarfon. 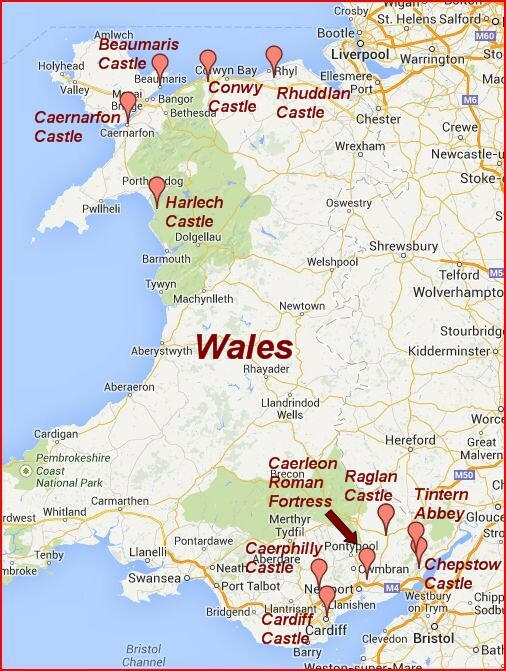 For a map of castles visited in Wales click here. Construction began in 1283 and was not yet complete when building efforts stopped in 1330. 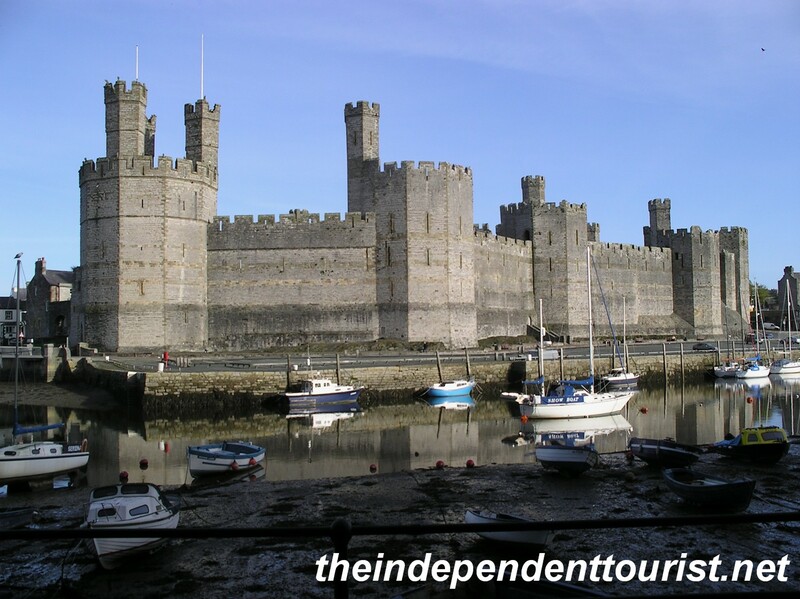 Caernarfon is famous for a number of reasons, not the least of which is due to it being the site of the investiture of Prince Charles as the Prince of Wales in 1969 by Queen Elizabeth. The future king of England is of course the father of Prince William and Prince Henry, known in the British military as ‘William Wales’ and ‘Henry Wales’. The first Prince of Wales, who became Kind Edward II in 1307, was born here (if you’ve seen the movie ‘Braveheart’ he is depicted as the weak heir to King Edward I) and in 1911 the investiture of Prince Edward took place here (he was an uncle of Queen Elizabeth, who became Edward VIII, but abdicated the crown and never became king) . The Granary Tower (center left) overlooks the Upper Ward and the investiture site of Prince Charles. The Eagle Tower (center right), and Lower Ward. Greatest of all the castle’s towers, it contains several apartments. 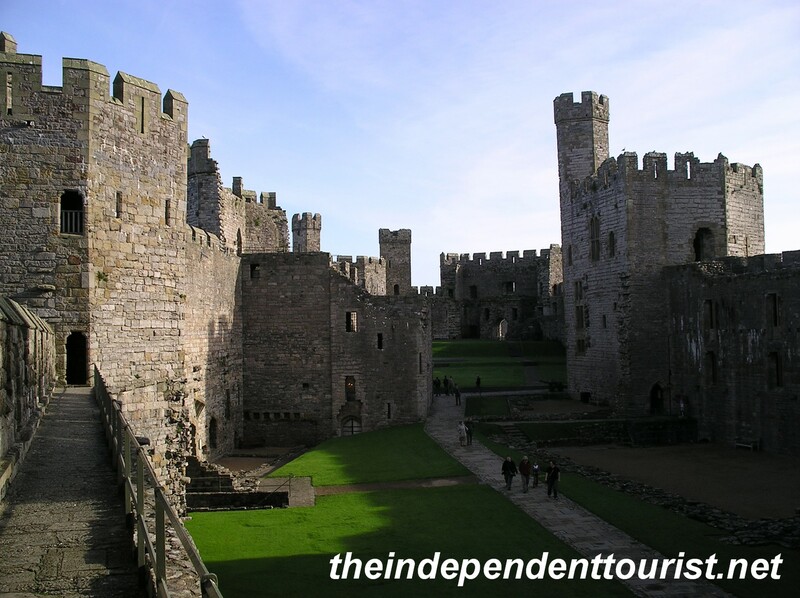 Caernarfon is a massive castle and has many interesting features, including octagonal (rather than round) towers and red brick bands in the walls that are reminiscent of the famous Walls of Constantinople (Istanbul), which was on purpose. The town of Caernarfon was a Roman settlement anciently, and some ruins of the Roman days are still present, not far from the castle. Just about all the towers are open for visiting, with various exhibits and great views from the viewing platforms. There are many corridors to explore too. I really loved this castle. The Well Tower on the left and Chamberlain Tower on the right. The great hall was in front of and below the Chamberlain Tower. The town of Caernarfon is about 22 miles west of Conwy (see my post on Conwy Castle here). Harlech Castle. 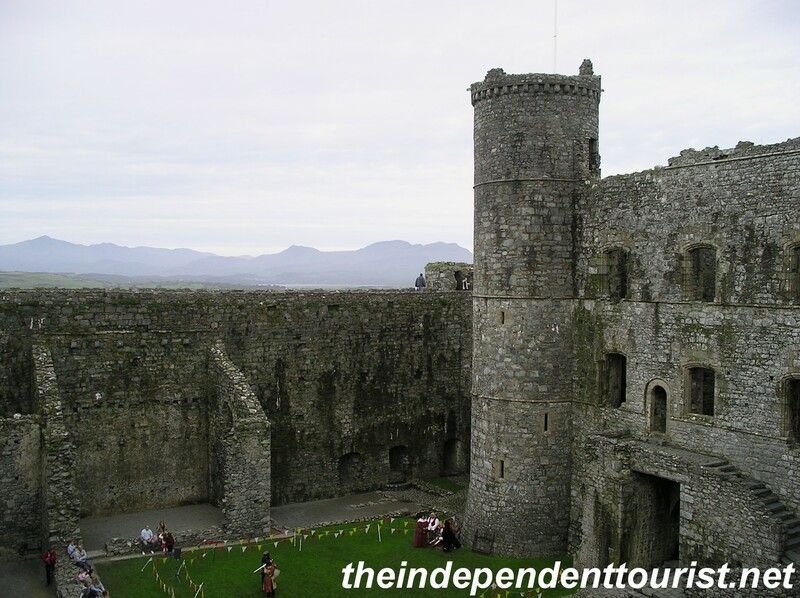 About 30 miles south of Caernarfon is Harlech Castle. This was another of King Edward I’s fortresses in northern Wales. 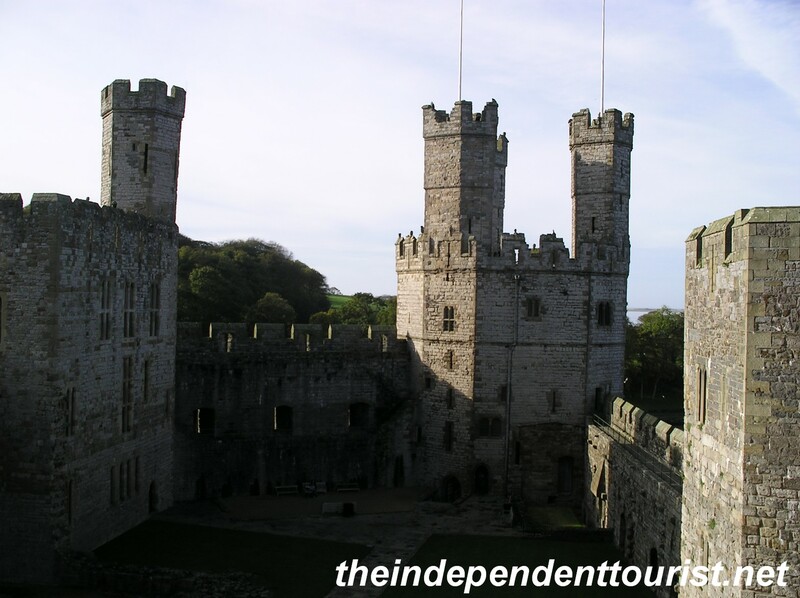 Construction began in 1283, the same year as Caernarfon and Conwy castles. Harlech castle sits on a rock outcropping high above the surrounding landscape, with the sea visible in the distance. 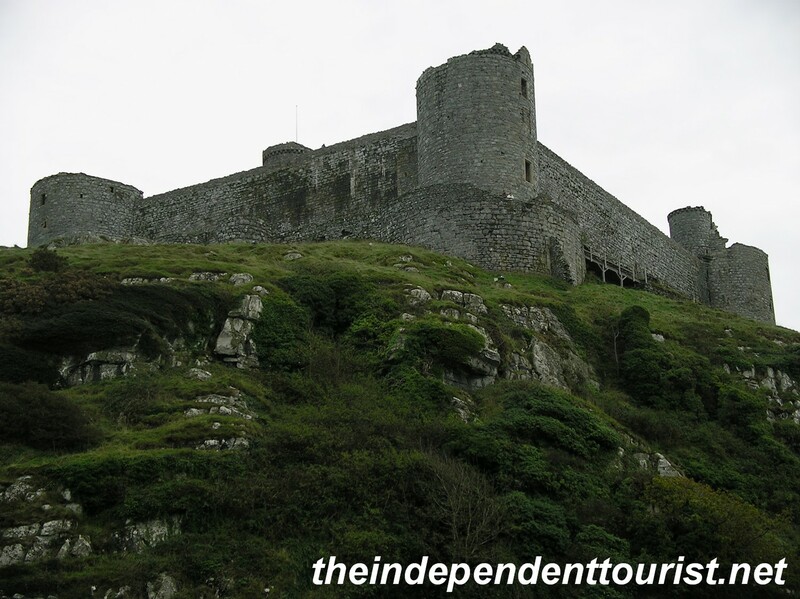 A view of Harlech Castle – with its commanding position, it would have been very difficult to attack. 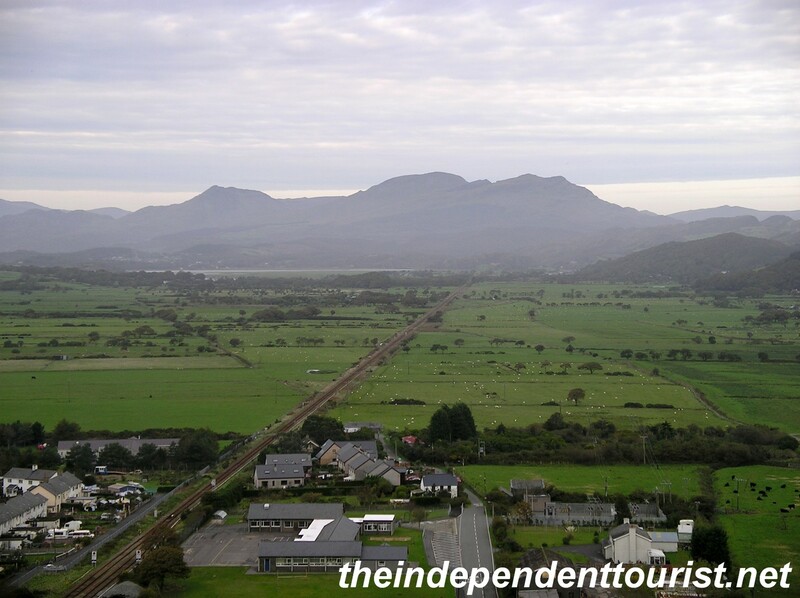 The view from Harlech Castle’s walls. The Irish Sea is in the distance. In the 13th century the coastline was just below the castle, allowing access to supplies from ships during times of siege, which were not uncommon in this castle’s history. 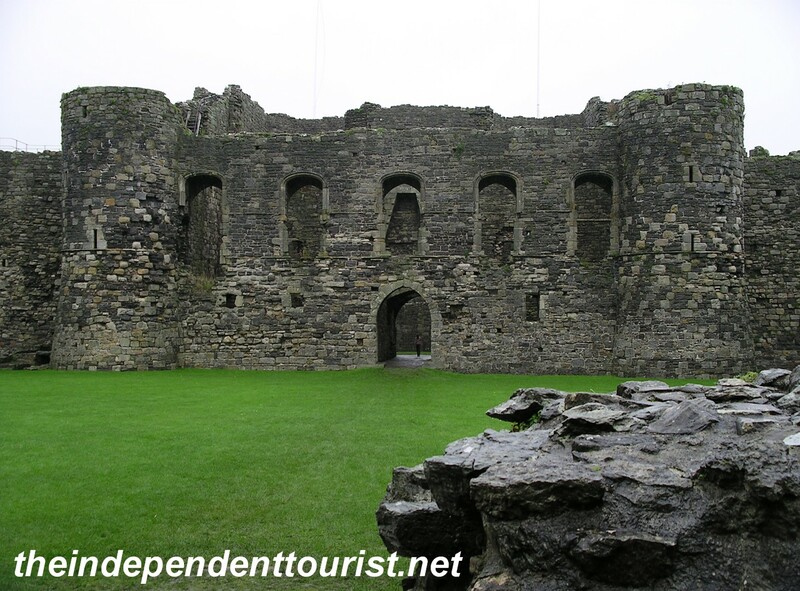 The interior ward of Harlech Castle. The main entrance is to the right. The original gateway into Harlech Castle. The longest siege was 7 years during the ‘War of the Roses’ (the long battle for the English crown in the 15th century). The castle has a great setting and history, but does not contain as many rooms and interior features as Caernarfon or Conwy castles. Posted in Wales and tagged Caernarfon Castle, Castles in Wales, Harlech Castle, Wales on October 13, 2013 by Paul Terry. 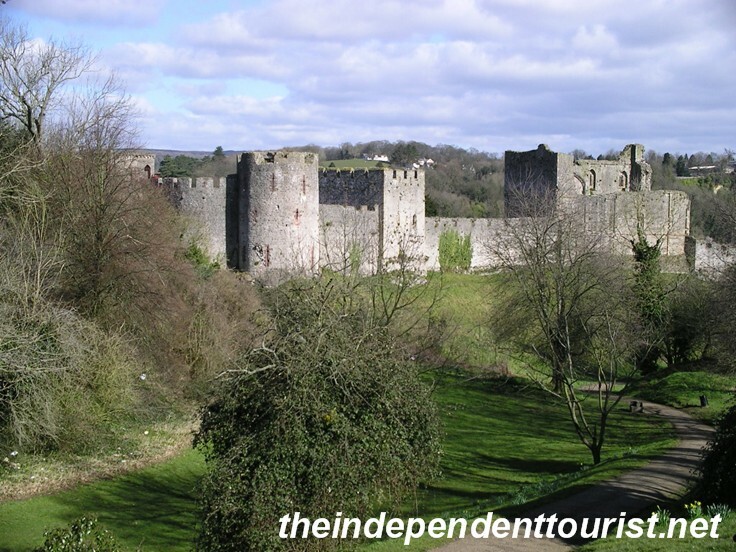 If you want to see some of the best medieval castles in the United Kingdom, visit Wales, a very small country in the western part of the United Kingdom. There is a concentration of castles in northern and southern Wales. In addition, there are Roman ruins and lovely medieval abbeys and churches. A map of locations I visited in Wales. Wales receives far fewer tourists than England and Scotland, and yet has some of the most beautiful natural scenery and greatest historical treasures in the UK. 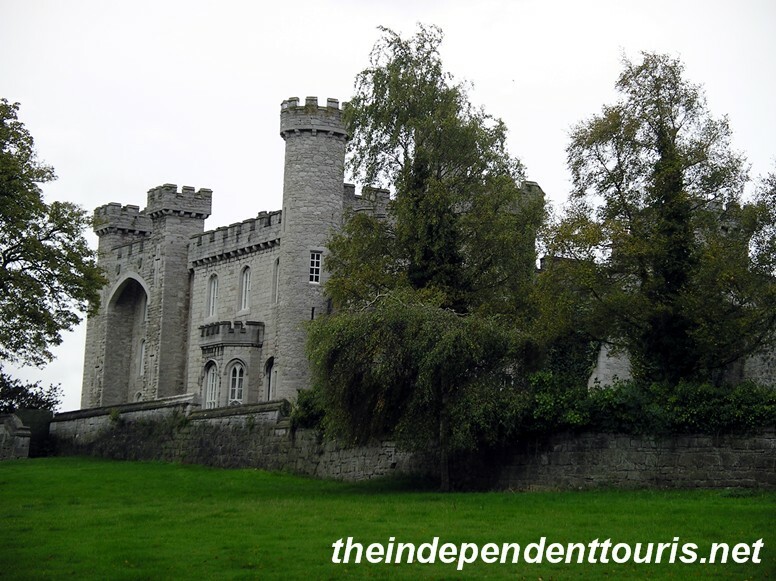 Northern Wales has a dense collection of castles, since it was the frontier of the English kingdom in medieval times. 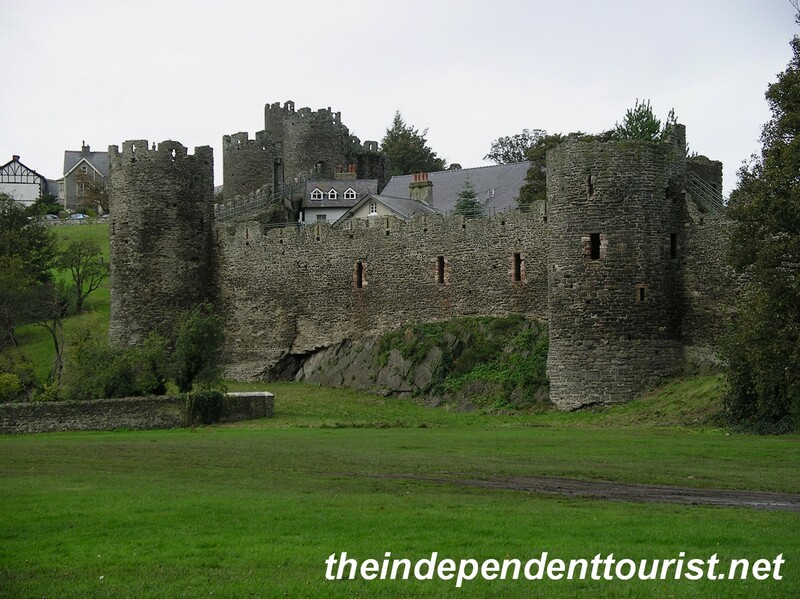 King Edward I established a number of castles here in the 1200’s to defend the newly conquered Welsh territory at the conclusion of the second war of Welsh independence. 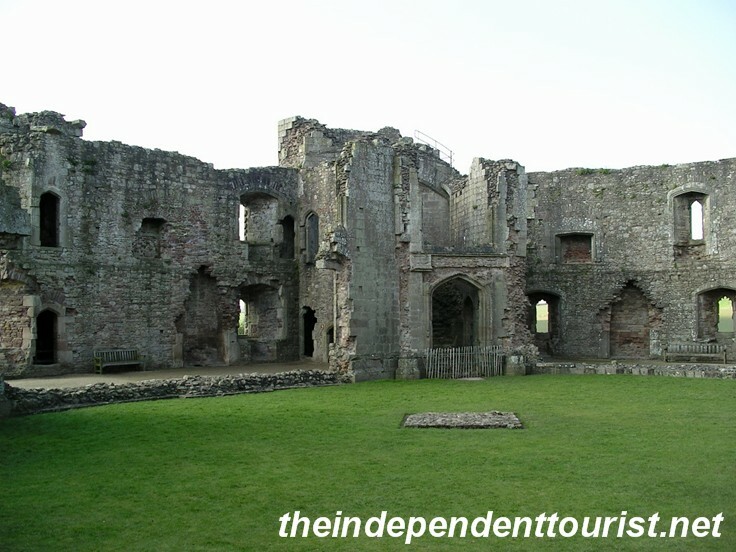 Rhuddlan Castle, not far from Conwy and a headquarters for King Edward I during his conquest of Wales. Even today, Wales feels more remote and “wild” than England. I recall driving at night through the middle of the country on my way to Hereford and not seeing lights from cars or villages for many miles. The rugged Snowdonia area of northern Wales. The best way to get around this small country is by car. Be forwarned that the roads are narrower than England and many are pretty much just one-lane winding country roads. Conwy Castle. With a great setting at the mouth of the Conwy River, Conwy is one of the UK’s most classic castles and it is quite intact, with a number of towers and rooms to explore. 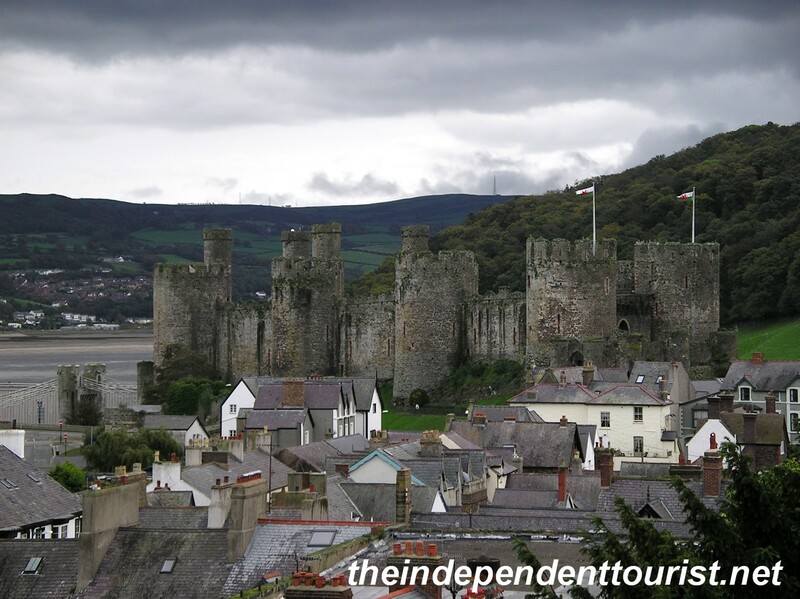 Conwy castle and the town walls were begun in 1283 and completed in 1287. A view of Conwy Castle from the town walls. The outer ward of the castle with the great hall at the right. 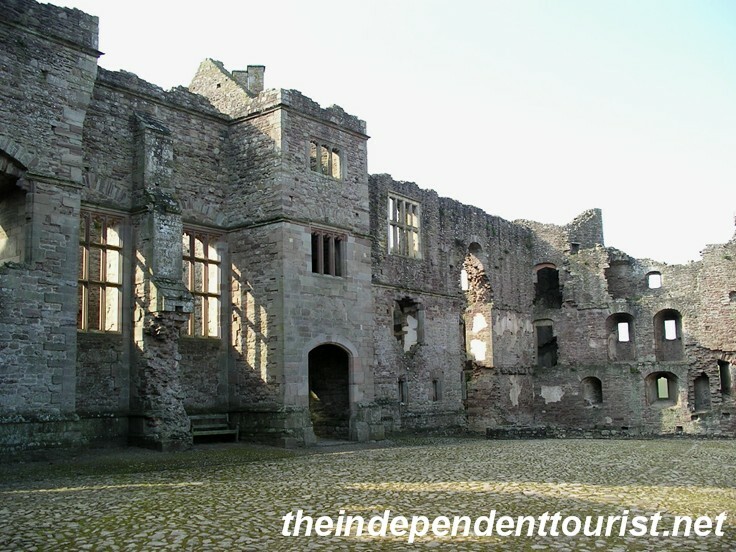 The great hall is unique in that it is bent to conform to the natural land formation. The walls around the town are intact and add to the charm of this small town. “The smallest house in Britain” is also located in Conwy. Unfortunately I didn’t know about it until after I had left! A view of Conwy Castle and town. Another view of Conwy Castle. 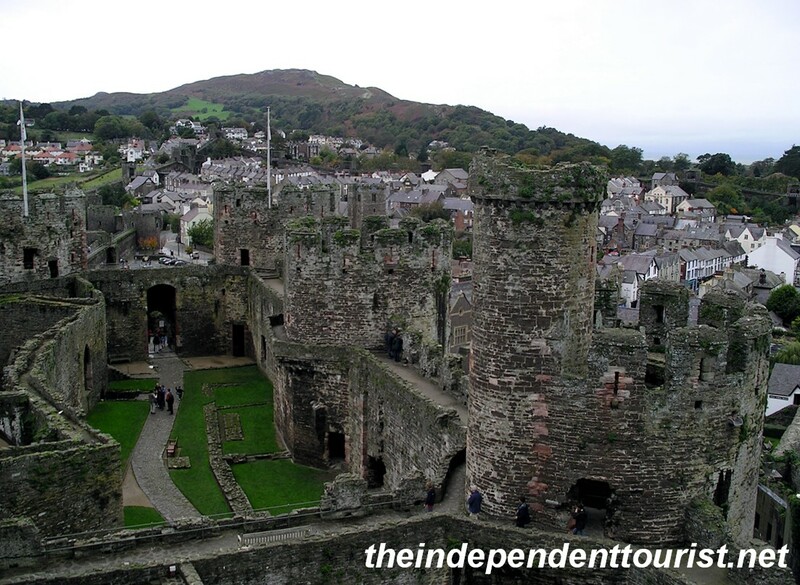 The walls surrounding the town of Conwy. Beaumaris Castle. Just 23 miles from Conwy is Beaumaris Castle located on the Isle of Anglesey. The castle is unique for a couple reasons – it was never finished and it is considered one of the most outstanding examples of medieval castle architecture. The moat at the entrance is picture perfect. 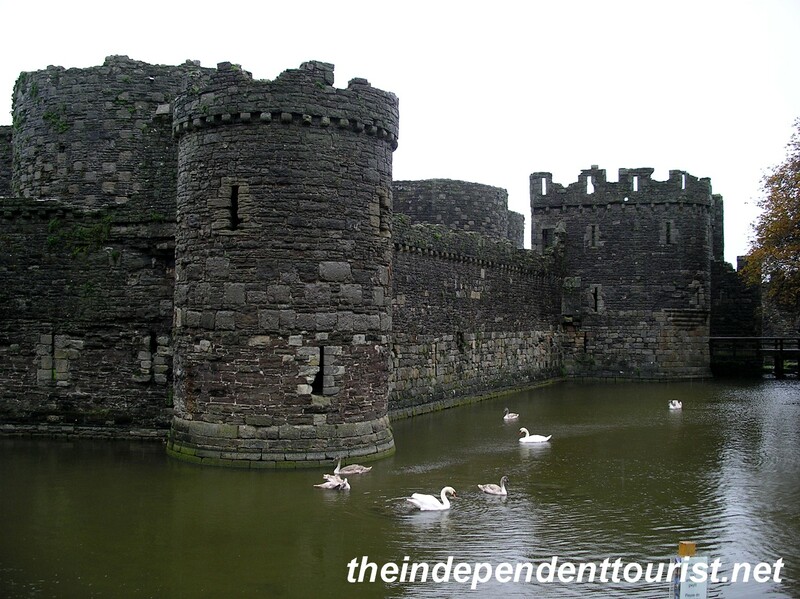 The exterior and moat of Beaumaris Castle. 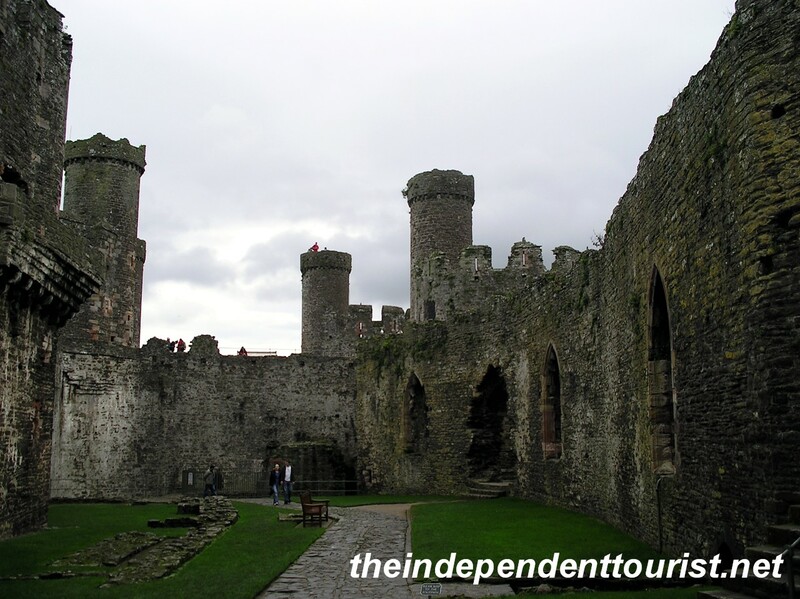 A view of the interior courtyard of Beaumaris Castle. 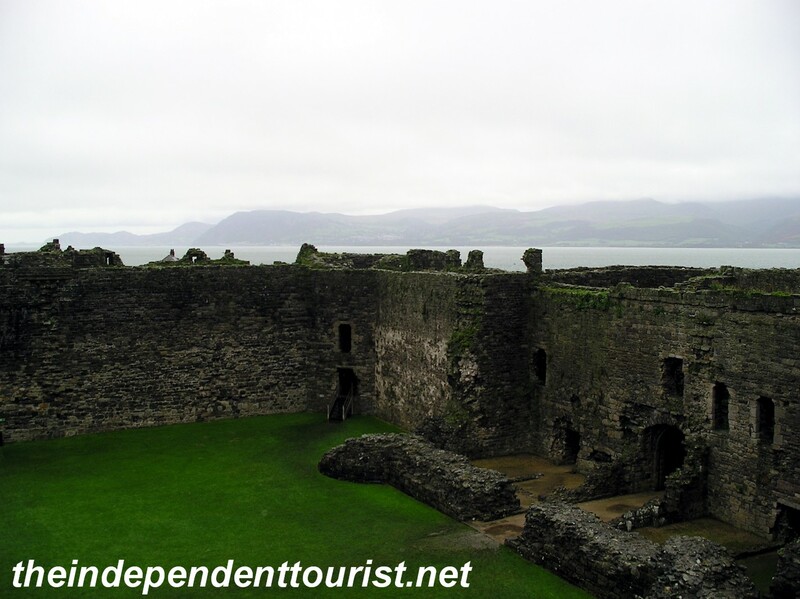 Another interior view of Beaumaris Castle. The construction of the castle began in 1295. There are many dark narrow corridors to explore, and a chapel. 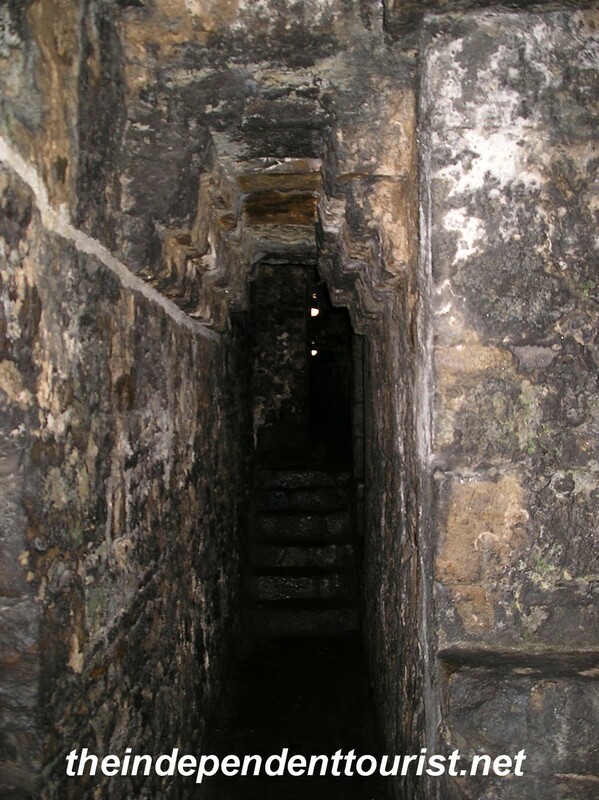 One of the many dark corridors in the walls of Beaumaris Castle. 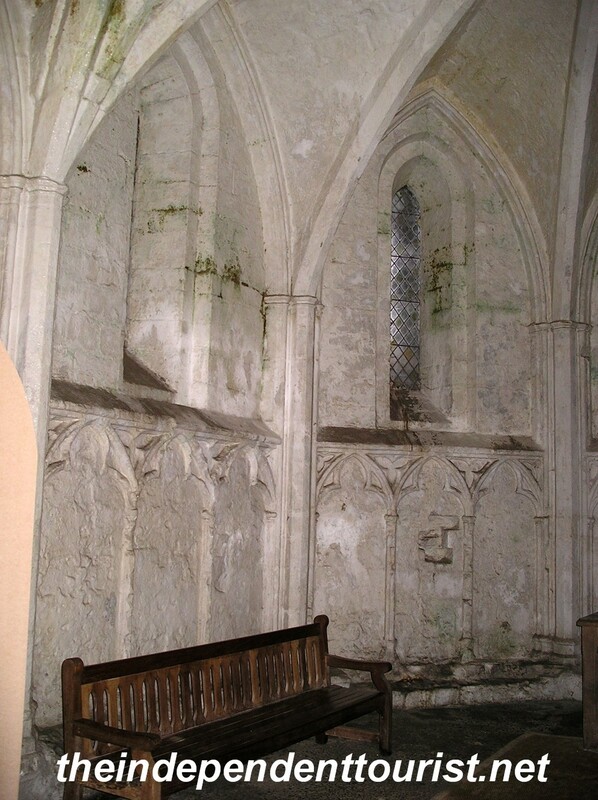 The chapel at Beaumaris Castle. For students of medieval castle architecture this castle is a gem, since the fortifications (particularly the entrance) showcase the defensive strategy of medieval warfare.